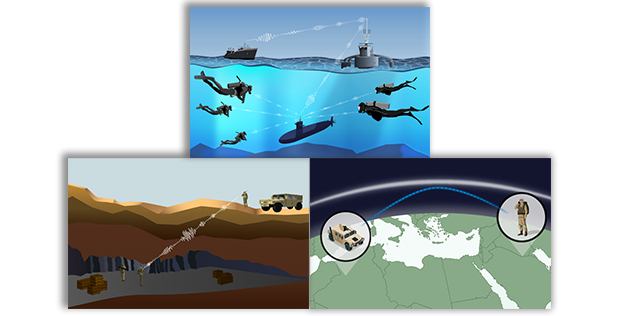 The Mechanically Based Antenna program could enable radio communication through seawater and the ground and directly between warfighters hundreds and ultimately thousands of kilometers apart. Here’s something easy to forget when you are chatting on your cell phone or flipping channels on your smart TV: although wireless communication seems nothing short of magic, it is a brilliant, reality-anchored application of physics and engineering in which radio signals travel from a transmitter to a receiver in the form of electric and magnetic fields woven into fast-as-light electromagnetic waves. That very same physics imposes some strict limits, including ones that frustrate the Department of Defense (DoD). Key among these is that radio frequency signals hit veritable and literal walls when they encounter materials like water, soil, and stone, which can block or otherwise ruin those radio signals. This is why scuba buddies rely on sign language and there are radio-dead zones inside tunnels and caves. With his newly announced A MEchanically Based Antenna (AMEBA) effort, program manager Troy Olsson of DARPA’s Microsystems Technology Office is betting on a little-exploited aspect of electromagnetic physics that could expand wireless communication and data transfer into undersea, underground, and other settings where such capabilities essentially have been absent. The basis for these potential new abilities are ultra-low-frequency (ULF) electromagnetic waves, ones between hundreds of hertz and 3 kilohertz (KHz), which can penetrate some distance into media like water, soil, rock, metal, and building materials. A nearby band of very-low-frequency (VLF) signals (3 KHz to 30 KHz) opens additional communications possibilities because for these wavelengths the atmospheric corridor between the Earth’s surface and the ionosphere – the highest and electric-charge-rich portion of the upper atmosphere – behaves like a radio waveguide in which the signals can propagate halfway around the planet. «If we are successful, scuba divers would be able to use a ULF channel for low bit-rate communications, like text messages, to communicate with each other or with nearby submarines, ships, relay buoys, Unmanned Aerial Vehicles (UAVs), and ground-based assets, Through-ground communication with people in deep bunkers, mines, or caves could also become possible», Olsson said. And because of that atmospheric waveguide effect, VLF systems might ultimately enable direct soldier-to-soldier text and voice communication across continents and oceans. To date, there’s been a huge and expensive rub to actually pulling off low-frequency radio communication in the versatile ways that Olsson has in mind. The wavelengths of VLF and ULF radio signals rival the distances across cities and states, respectively. And since longer wavelengths have required taller antennas, communications in these frequency bands have entailed the construction of enormous and costly transmitter structures. A VLF antenna that the U.S. Navy built on a remote peninsula in Cutler, Maine, in the heat of the Cold War just to send a trickle of data to submarines makes the point: the gargantuan transmitter complex occupies 2,000 acres/8 square kilometers, features 26 towers up to 1,000 feet/305 m high, and operates with megawatt levels of power. With the AMEBA program, Olsson aims to develop entirely new types of VLF and ULF transmitters that are sufficiently small, light, and power efficient to be carried by individual warfighters, whether they are on land, in the water, or underground. Rather than relying on electronic circuits and power amplifiers to create oscillating electric currents that, when driven into antennas, initiate radio signals, the new low-frequency VLF and ULF antennas sought in the AMEBA program would generate the signals by mechanically moving materials harboring strong electric or magnetic fields. In principle, this is as simple as taking a bar magnet or an electret – an insulating substance, such as a cylinder of quartz (silica) glass, in which positive and negative electric charges are permanently segregated to create an electric dipole – and moving it at rates that will generate ULF and VLF frequencies. To open up practical new capabilities in national security contexts, however, the challenges include packing more powerful magnetic and electric fields into smaller volumes with smaller power requirements than has ever been achieved before for a ULF or VLF transmitter. That will require innovations in chemistry and materials (new magnets and electrets), design (shapes and packing geometries of these materials), and mechanical engineering (means of mechanically moving the magnets and electrets to generate the RF signals). «Mobile low-frequency communication has been such a hard-technological problem, especially for long-distance linkages, that we have seen little progress in many years», said Olsson. «With AMEBA, we expect to change that. And if we do catalyze the innovations we have in mind, we should be able to give our warfighters extremely valuable mission-expanding channels of communications that no one has had before».